Hi friends. I hope you are all enjoying the start of summer. Thanks to everyone who stopped by last week to link up to our 100th Cooking and Crafting with J & J Link Up and Giveaway that I co-host with Plucky's Second Thought. We really appreciate all of you talented bloggers who linked up all of your projects with us! Last year I had a blogger link up to our Monday Cooking and Crafting with J & J Link Party that I co-host with Jess from Plucky's Second Thought. 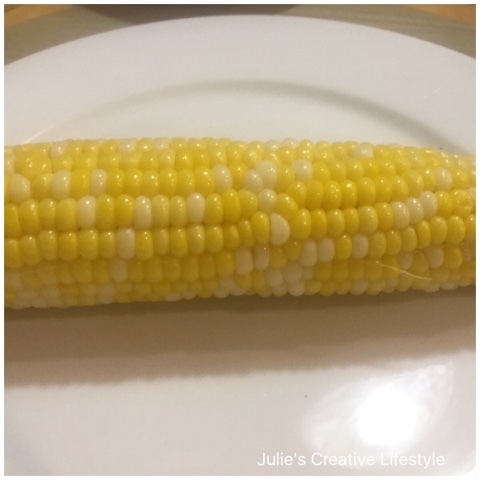 Angie shared a blog post on how to make Crock Pot Corn on the Cob. You can see her post for the recipe HERE. When I saw that recipe, I just knew that I wanted to try and make it too. Well, I made the corn on the cob that way, and it tasted so good and it was so easy to make. What I love about using the crock pot, is that you do not have to be standing over a hot stove to make it. Meanwhile, I can be doing other things while the corn is cooking. Just make sure that you have the time to cook the corn in your crock pot before your dinner or BBQ. It's so easy to prepare and you will be so happy that you won't be cooking over a hot stove. ** Since the last time I used that oval crock pot to make the corn on the cob, the lid broke and I had to throw away the pot. I wanted to replace the lid with a new one but they don't make those lids anymore. I now use a round shaped crock pot that used to be my mother-in-laws. I love that crock pot, but now I'll have to break the corn in half to fit in my round shaped pot. I hope you try this way to make your corn on the cob. Let me know if you cook it this way, and how you liked it. 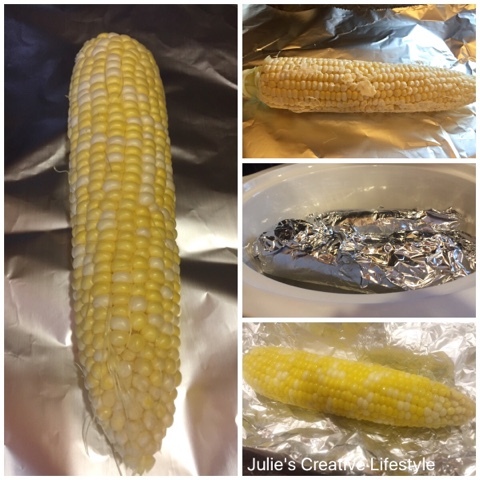 Thanks Angie from The Country Chic Cottage for sharing this way to make corn on the cob. I will definitely be making my corn this way this year too. If you would like to see another way to make corn on the cob, just stop by Jess from Plucky's Second Thought to see how she makes it. 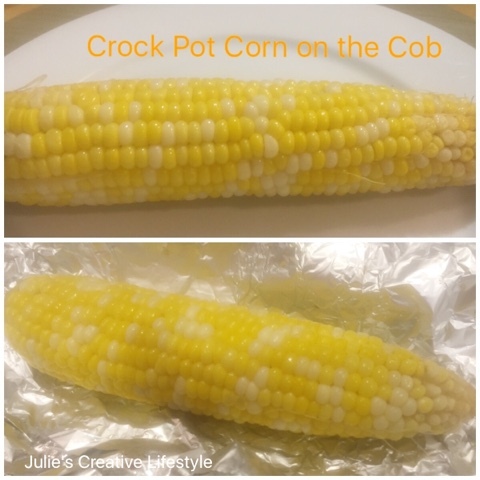 This is the perfect way to make crock pot corn on the cob and stay cool in the kitchen. 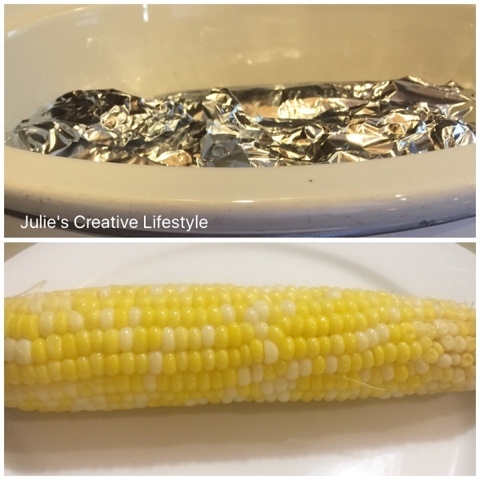 Wrap each ear of corn in aluminum foil with 1/2 tablespoon of butter and salt to taste. Wrap tightly to make sure that butter does not leak out. Add all of your ears of corn to crock pot. Cook on low for 4-5 hours or high 2-3 hours. Remove carefully from crock pot as the corn will be hot. What a fabulous way to cook corn on the cob. You're amazing, my friend! Hugs to you! I love how easy this is! I make potatoes in the crock pot but I haven't tried corn on the cob! Heading over to see Jess' way now! OMG, must try! I'm a sucker for anything Corn! Thanks for sharing dear! Amazing!I am doing this tomorrow with the corn I just bought today! Thanks Julie! I love using my crock pot to prepare meals especially in the summer. This sounds like a great recipe. In the summer I put the corn on the grill, but I think if I had several ears this would be the way to go. Thanks Julie! Looks so god but unfortunately, I can not eat corn. Thanks so much for stopping by!! Never thought to do this in the crock pot!! Great way to cook corn on the cobb. Thanks for sharing this Julie. Happy Thursday. I love using my Crockpot and I will be trying this sometime this summer. My crock cracked a while back in my big oval crockpot and I was devastated. I think I put it in the fridge while it was still too hot. I found a number to call on the Crockpot website and was happy to learn they would send me a replacement crock for only $12! They covered shipping. I love cooking in my Crockpot. It frees up my time for other things. I'll have to try this way, Julie. I usually cook corn on the cob in the microwave, but I'm always willing to try new ways of doing things. That's a bummer about the lid breaking. I've never made corn on the cob in the crock. I definitely want to try it! Interesting! Is there anything you can't cook in a crock pot??!! This is perfect for a large amount of corn..thanks for the recipe. Hi Julie, it is always great to find different ways to cook food. i haven't tried that one yet, but i always appreciate more helpful hints. I also use the microwave with wax paper. 1-2 minutes each in the microwave does wonders. Crock pots are so handy! Looking forward to trying this! Sounds yummy! I have never thought of this, great idea! Thanks for sharing at Home Sweet Home! What an easy way to make corn on the cob!!! I'll have to try it out! This is something I never would think to put in a crock pot - genius! Thanks for linking up at Best of the Weekend, Julie! I've never tired this, good to know. Thanks. Obviously that should say tried not tired! The whole point is you wont be tired after making this right?! I've never thought of using the crock pot for corn on the cob! What a great idea, Julie. Thanks for sharing at Snickerdoodle. Pinning. What a great way to do corn on the cob! Much better than boiling a huge pot of water in the dead of summer!